Nurture at TEDMED 2012, I don’t want to get old! Nurture by Steelcase shared a very critical product development message at TEDMED: When designing anything you must start with an understanding of all the needs of the end-user. In that vein, their space allowed people an opportunity to try a “Third Age Suit”. Once you have the suit on your motor skills are instantly aged by 30 years. This experience helped attendees gain first-hand insights about the user needs to consider when designing a chair for the elderly. That’s me, Grandpa Tom, in the photos trying to reach the ends of the armrest to eventually stand up from the new empath recliner by Nurture. Another very interactive aspect of the booth were custom chalk table tops. These were also a big hit and a fun way to join the conversations about questions that were being asked and the big ideas people were taking home. TEDMED 2012, the Social Hub Rocks! So, what do you put in a tent the size of a football field to create an incredible experience at TEDMED? Well, we did a lot, but start with an impressive list of sponsors and great food, then design cool common-spaces to pull people together. Our focus was to create a Social Hub and Simulcast Lounges that made it easy for delegates to connect with experts – both from the medical and non-medical disciplines. When these connections happen the event moves from interesting to magical. To help make these connections we provided a variety of different lounge and café settings. The 16-foot long tables, for example, worked well– they were very easy to approach, connect a device to the power supply, and meet a new friend. I also used a die-cut fabric from Designtex to create a ceiling cloud over two other settings to make a more intimate space. Intimate spaces yield open conversations and I love a comment that I overheard: “I can’t decide what is better. The talks from the stage or all the great conversations I’m having.” Perfect! 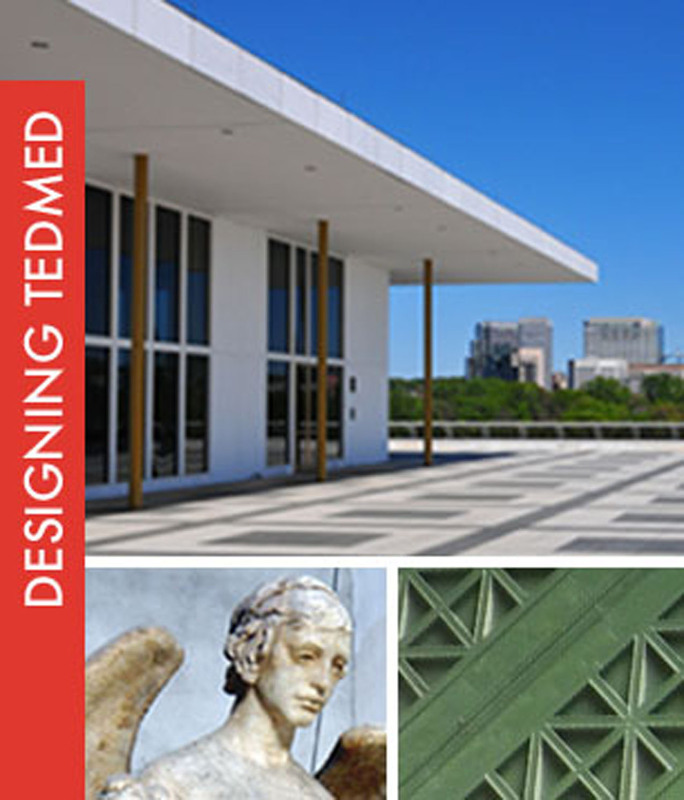 Check out the TEDMED blog below for a brief day-to-day summary of the conference.